Trying to decide where to buy your next mattress in the Dallas, TX area? Check out these shops for the best prices, discounts and range of options. Dallas is one of the fastest-growing cities in the United States, with a booming market for mattresses. No less than 79 mattress stores exist in the metropolitan area, from independent shops to nationwide brands, catering to every type of buyer. New arrivals and growing families will want to know exactly where to buy a mattress in Dallas, and where to find the best quality, best fit for their needs, and best possible price in their neighborhood. Whether you’re shopping for a top-of-the-line luxury model with smart technology or simply a decent, affordable mattress, we’ve got you covered. 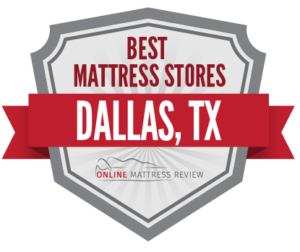 Read on to find the product you’re looking for at the mattress store in Dallas nearest to you. The heart of the city is bustling with business and activity, but you won’t find any mattress stores in Dallas within the immediate downtown area. Move a little bit north, though, and you’ll find two centrally-located mattress stores: Dallas Luxury Beds (1444 Oak Lawn Ave) and Mattress Firm- Uptown (2633 McKinney Ave). The former is an outpost of Chicago Luxury beds, the first stateside retailer of ultra-luxury Swedish brand, Hastens. The store is set up as a supremely refined “sleep spa” with “concierge services” such as sleep assessment and mattress rotation. Mattress Firm, on the other hand, is a national chain with a total of 14 mattress shops in Dallas. This large mattress store retails brand-name spring, memory foam and adjustable mattresses. Customers give the Uptown location positive reviews for the knowledgeable and professional sales staff. Mattress Firm dominates the landscape here, with a total of 9 mattress stores in Dallas located north of the city center. Of these locations, the ones in Vickery Meadow (10910 N Central Expy), Mockingbird Central Plaza (5400 E Mockingbird Ln) and North Dallas (10759 Preston Rd) have the greatest number of positive reviews. The chain retails a selection of 55 different types of brand-name beds, including basic models and others with the latest materials and sleep technology. The abundance of locations and wide selection makes this mattress store in Dallas a convenient destination. Those in search of a greener option should consider Dallas Natural Mattress (11661 Preston Rd), one of the few mattress stores in Dallas to sell natural products. This mattress shop has been in business for 60 years and builds their own products locally from plant-based memory foam. If, on the other hand, you’re after the most affordable mattress, visit Mattress Clearance Center Dallas (9665 N Central Expy), where customers rave about bargain buys. You’ll find few mattress stores in Dallas located south of the city center. In fact, the only source that’s consistently well-reviewed is BT Furnishings (4350 Gannon Ln). As the name implies, this store sells furniture as well as mattresses, making it a great stop for those needing not only an affordable mattress but a bed (and maybe a dresser or two) as well. BT Furnishings is locally owned and has been in business for 25 years, offering affordable pricing and convenient, same-day delivery. The mattress shop in East Dallas that earns the most positive reviews is USA Mattress (1707 Alpine St), a family-owned mattress store which prides itself on providing, “good beds, good people and good prices.” Beds and bedroom sets, as well as mattresses, can be had at Rico’s Furniture (1018 S Buckner Blvd). This small, family-owned furnishings and mattress store is well-reviewed for prices but can be crowded with merchandise, so plan for a bit of hunting. If you prefer a more spacious mattress shop, there’s always the wide selection and expansive showroom of Mattress Firm, which has a store in Northeast Dallas (6464 E Northwest Hwy), located in the Medallion Center. Simmons Mattress Outlet (1290 Conveyor Lane) is the go-to store for an affordable mattress in Dallas’ western area. Customers rave about the bargain prices they score on BeautyRest products, including pocketed coil spring and hybrid mattresses. Over in Oak Cliff, shoppers in search of an affordable mattress can also check out Great Sleep Mattresses (4040 W Davis St), which carries most major brands at wholesale rates, and stocks bedroom furniture as well.